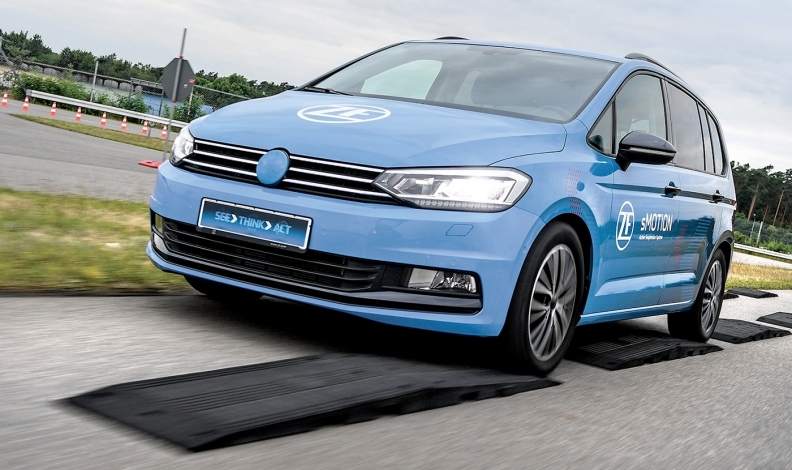 Driving over bumpy roads can cause motion sickness, so engineers at ZF have developed SMotion, a chassis system that makes riders feel like the vehicle is on a magic carpet. Editor's Note: Sign up to receive each bi-monthly issue of Shift. Relax in a vehicle and read a book, stream video or drift into a well-deserved nap. Or sit at a mobile desk and do some work. These are the promised advantages of travel in a self-driving era. But for more than a few passengers, any attempts to crack open a novel or watch a favorite TV show might result in a frantic search for a barf bag. As automakers and tech developers spout promises of a fanciful future in which motorists trade the tedium of commuting for newfound free time in their vehicles, concern is growing that many passengers will be unable to reap the benefits. Motion sickness may prevent millions of riders from enjoying the leisure and entertainment benefits self-driving technology is supposed to bring. In a 2016 study, "Would Self-Driving Vehicles Increase Occupant Productivity?" 8 percent of respondents told University of Michigan researchers that they expect to "frequently experience" motion sickness — and they're the ones who know they're susceptible. Once self-driving vehicles arrive, the percentage of afflicted occupants likely will be higher, warns Michael Sivak. He co-authored the Michigan study and now is an independent consultant and researcher. Drivers are mostly immune from motion sickness, he says, because they're watching the road and receiving visual information that matches information sensed in the inner ear. A conflict between the two results in nausea, headaches and vomiting. "When autonomous vehicles become more of a reality, we realize that now everyone is going to be a passenger," Sivak says, "and that potential pool of people who might be subject to motion sickness has greatly increased." Automakers aren't overlooking the crimp this could put in their plans for self-driving vehicles. In addition to further honing their technology and navigating an assortment of laws and regulatory policies, they're preparing to combat the problem. Forget asking riders to take Dramamine before every trip. Their solutions range from chassis innovations to more unusual measures, such as the use of light pulses that flash in an occupant's peripheral vision and redesigned vents that blast occupants with fresh air when algorithms detect the onset of motion sickness. About half of the money invested in vehicle interiors focuses on driver happiness, says Guillaume Peronnet, vice president of strategy at Faurecia. But with self-driving cars, that will change. "The focus is shifting: The passenger is becoming the customer," he says. Automakers and suppliers will have to work on detecting the potential for motion sickness before it happens, he says, by knowing more about the passengers and more about what is happening on the road. With nearly three quarters of Americans afraid to ride in fully self-driving vehicles, according to studies, keeping those interested in the technology healthy enough to use it will be crucial. In a way, solving motion sickness presents a challenge similar to one autonomous vehicle developers have already undertaken. It's a matter of perception. Just as algorithms fuse together data from cameras and high-definition maps to locate themselves, the human brain accomplishes the same general task with visual cues from the eyes and vestibular information from sensors in the inner ear. Problems arise when there's discord between the two. So far, approaches to keeping the two in harmony involve adding visual information or minimizing roll, pitch and yaw movements that change the vestibular information. At ZF, engineers have developed a chassis system they call sMotion that has compact, external electric-motor pump units with integrated electronics that raise and lower the piston rods independently on each wheel. Translation: Passengers could be rumbling over the largest potholes in Detroit and the potholes might feel like pebbles instead. If the vehicle chooses to swerve around the potholes, the two inner wheels can be retracted and the outer ones extended, diminishing the yaw forces that might otherwise unsettle riders. "The idea is that riders feel like the vehicle is not so much on the road as they are now on a magic carpet," says Joe Lagodzinski, engineering manager for advanced technologies and ride development in ZF's chassis division. Using information from onboard cameras and lidar sensors, the system can be as much predictive as it is reactive. When a pothole is detected on the road ahead, for instance, actuators can keep an affected wheel at the height of the road surface instead of allowing it to drop during the duration of the tire's movement over the pothole. Part of the challenge for ZF's engineers has been developing the system without prioritizing the driver as they might have done in the past. Instead, they must put the comfort of all occupants on equal footing. Another part of the challenge rests in avoiding inadvertent mistakes that worsen motion sickness. "We have to make sure that ride frequencies are set in tune with the human body," Lagodzinski says. "We have the ability to lower those frequencies, and you can be very efficient at reducing their occurrence and amplitude, but you can also put them in the range that the human body doesn't like. So we have to be aware of that. We don't want to upset the balance." SMotion is slated for production in 2024. ZF officials say the system is drawing interest from automakers for use in autonomous vehicles. The system is an evolution of the company's continuous damping control that's been in the marketplace for more than two decades. From that perspective, minimizing inputs makes sense, as the supplier builds on what it has done best. Newcomers to industry, on the other hand, believe the fastest way to save passengers from motion sickness is by focusing on their eyes. After studying motion sickness in conventional cars while at the University of Michigan, Sivak and his colleague Brandon Schoettle became intrigued by the potential complications in an autonomous era. So they didn't stop with their research. The two invented the Universal Motion Sickness Countermeasure System, a device that uses pulses of light to mimic the visual cues people would receive in their peripheral vision if they'd kept eyes on the road. Worn like a pair of goggles by passengers, the device would measure yaw rate, velocity, acceleration and lateral movements and flash lights along the left and right sides to help prevent sensory mismatches. "It could be something you keep in your glove box and use as needed," Sivak says. "The wearable embodiment has the beauty of leaving the central vision unaffected." Sivak and Schoettle patented the device in January. A separate version of the system described in the patent filing incorporates vehicle-mounted lights on the A-pillar, B-pillar, windshield, doors, dashboards or side panels. They're in discussions with automakers and suppliers regarding licensing options. They're not alone. Last fall, engineers at Uber received a patent for a Sensory Stimulation System for an Autonomous Vehicle. As described in its patent, the system contains "light bars" embedded in the ceiling and doors, as well as screens around the cabin, to provide multicolored lights that flash based on acceleration, braking or turns by the autonomous vehicle. Because the vehicle's self-driving system would know its planned movements ahead of time, the system could flash its light pulses in a predictive, proactive fashion. Uber also would use seats with motors that help control pitch, roll and yaw. Further, it would blast occupants with air from vents on the dashboard and perhaps through outlets on the headrests. Together, Uber says the haptic, visual and sensory stimulations would help train passengers' bodies to adapt to conditions that cause motion sickness. "In some examples, the sensory stimulation system can provide a subconscious or unconscious learning atmosphere … that can be developed," Uber engineers Matthew Sweeney and Emily Bartel write in the filing. Eventually, passengers could provide feedback to anti-motion sickness systems, which could create a profile for each rider. 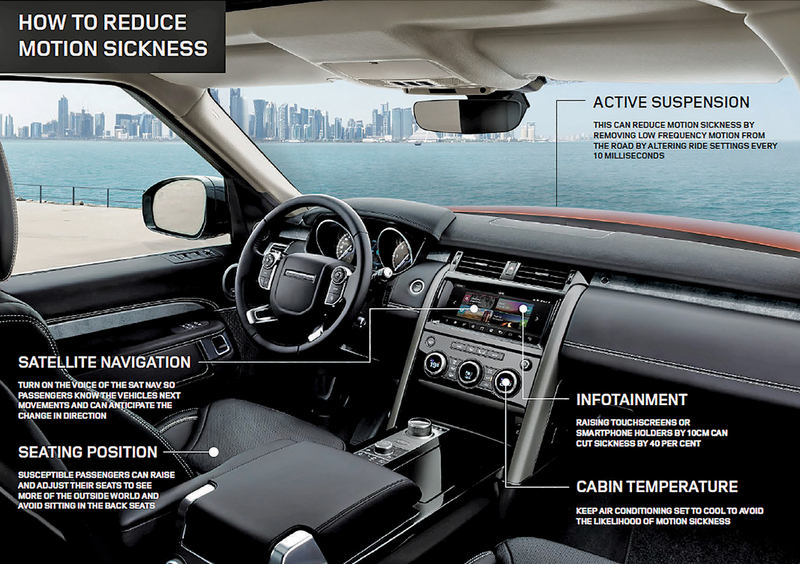 Jaguar Land Rover engineers have written an algorithm to generate an occupant wellness score. The company has collected motion-sickness data while occupants perform tasks such as checking email or reading a book in a vehicle. From this, they've created a preferred driving style that can be tailored to each occupant, resulting in a decrease of up to 60 percent in severity of motion-sickness symptoms. The score relies on biometric sensors that record physiological signs such as the onset of nausea. The sensors are correlated with motion and vehicle dynamics data, and together, JLR says, the vehicle will more reliably know when a passenger is going to become carsick. "As we move toward an autonomous future where occupants will have more time to either work, read or relax on longer journeys, it's important we develop vehicles that can adapt to reduce the effects of motion sickness in a way that's tailored to each passenger," says Spencer Salter, wellness research engineer at JLR. Beyond the comfort of riders, what's at stake is clear. A "passenger economy" is expected to rise with the broad adoption of autonomous vehicles. Freed from driving, occupants will morph into an army of worldwide riders who will have an extra 60 billion hours per year to check email, stream video, read books and shop online, according to a June 2017 report from Strategy Analytics. The report's authors say the vehicle will transform into a "media and entertainment hub," worth billions of dollars — if the passengers at the heart of this economic juggernaut don't wind up vomiting.